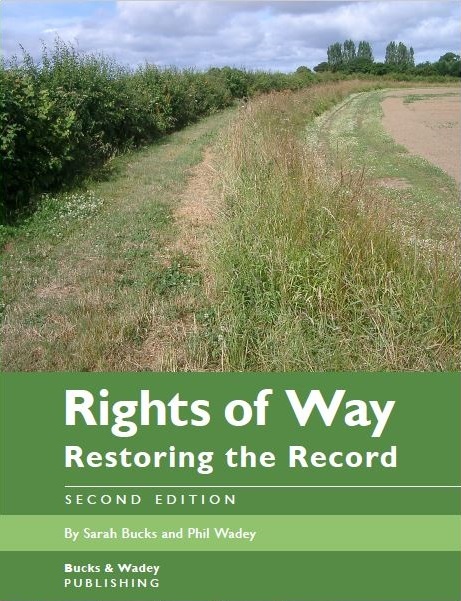 The authors provide training on applying the methods in Rights of Way: Restoring the Record in a systematic way for various groups. Each session takes a full day. Please contact a session organiser for further details. Information about the training days is also posted on our Facebook page. The authors will provide training for any other organisations that would like it - please get in touch soonest to discuss 2019 training days. The authors also provide talks to Local Access Fora, user groups and research groups. Please get in touch to discuss dates. Watch out for the Winter/Spring series of training dates! As soon as we know, we'll post the information here. Wolverhampton Racecourse, Dunstall Park, Wolverhampton, Staffordshire WV6 0PE Online booking is open. 20 attending so far. Bicton Vollage Hall, Church Lane, Shrewsbury, Shropshire SY3 8ER Online booking is open. 18 attending so far. Bramhall Village Club Hall, 2 Melbourne Road, Stockport, Cheshire SK7 1LR 33 trained! Victoria Centre, Stafford Road, Sheffield, South Yorkshire S2 2SE 30 trained. Sevenoaks Community Hall, Crampton's Road, Sevenoaks, Kent TN14 5DN 20 trained. Glyme Hall, Burford Rd, Chipping Norton, Oxfordshire OX7 5DZ 24 trained. Bicester Hotel & Spa, Chesterton, Bicester OX26 1TE 40 trained. Town Hall, Market Place, Henley on Thames, Oxfordshire RG9 1AQ 40 trained. More details. Barnston Village Hall, Essex CM6 1LR 14 trained. Harston Village Hall, Harston, Cambridge CB22 7PX 17 trained. The Harold Club, Huddersfield Road, Low Moor, Bradford BD12 0UD 29 trained. Village Hall, Elkstone, Gloucestershire GL53 9PB This one is by invitation only (small venue). A dozen trained. Old County Offices, Walton Street, Aylesbury HP20 1UY Another 40 trained! Leeds LAF members can read our slides on Huddle. Bristol LAF members can read our slides on Huddle.